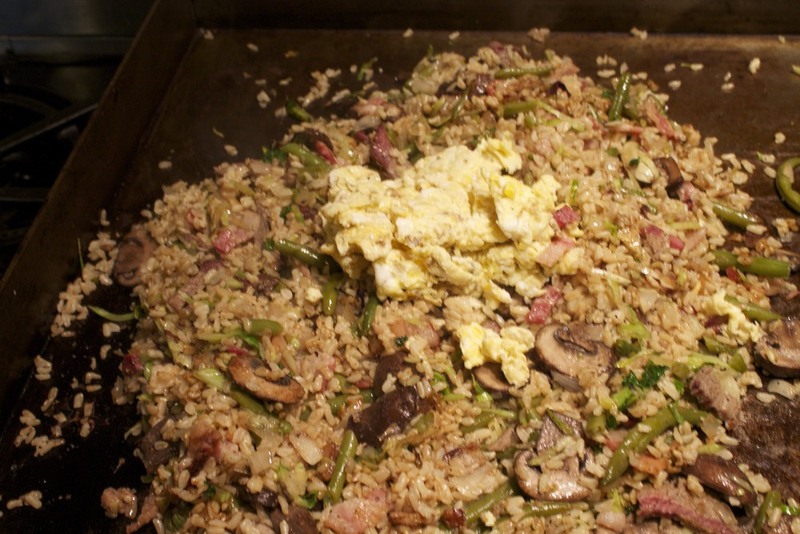 I make my fried rice on my flat top, but I realize that not everyone is lucky enough to have one. No problem! 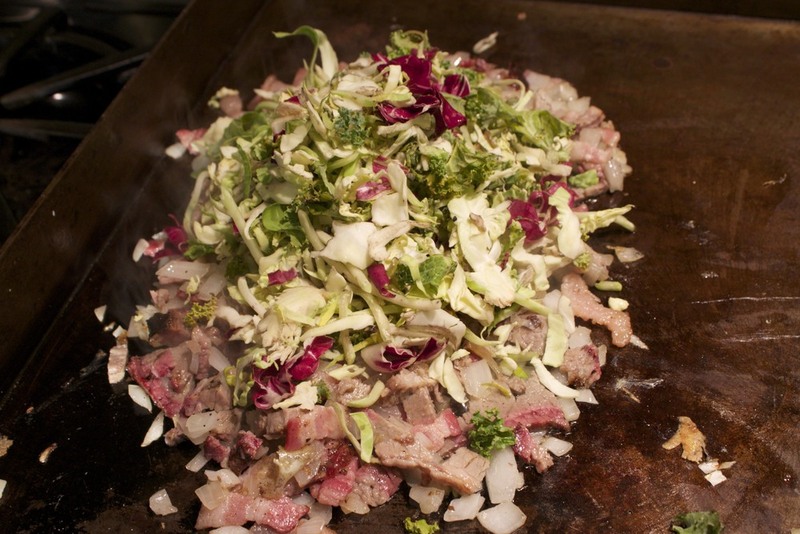 Just use a wok or the biggest skillet you have. 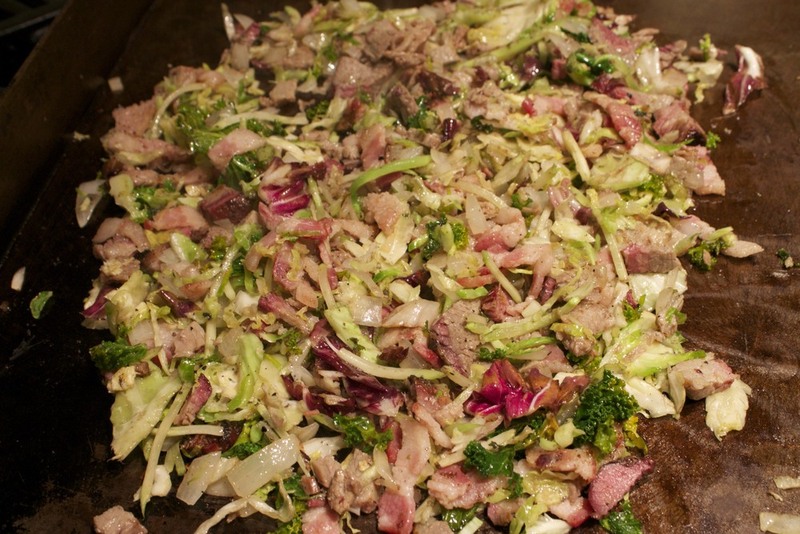 The idea is to have a lot of surface to cook on because you want to fry everything rather than saute it. Start by getting the surface very hot. Chop the bacon and throw it on the hot surface to start cooking. While it is cooking, crack the 3 eggs into a bowl and scramble them. When the bacon fat starts to render, use some of it to cook the egg, then transfer the cooked egg to a bowl. Next add the onion and cook until translucent. Mix the bacon in and add the brisket, stirring all together. Then add the greens, the mushrooms, and any other veggies you have (I added some leftover green beans) stirring and cooking after each addition. Now it's time to add the rice. If the mixture seems a little dry, go ahead and drizzle a little more oil over it. 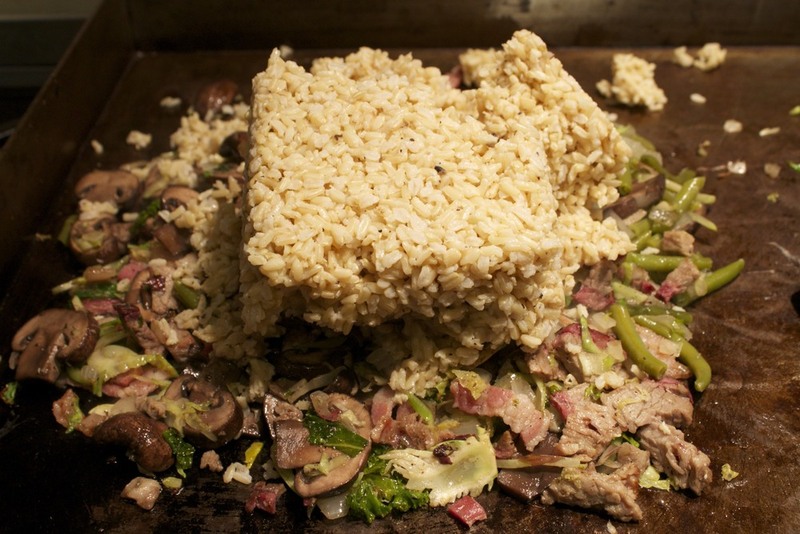 Stir the rice to mix everything together and sear the rice a little. Now add the soy sauce and sesame oil and mix well. Add the cooked egg and combine. Taste and adjust seasonings. We like things on the spicy side so I added some red pepper flakes. Top with the green onions. There are a few tips that will make your rice perfect every time. First of all, use cold rice. By that I mean that it has actually been refrigerated before you use it. This helps dry it out just a little so that it doesn't become gummy. The other thing you need to do is to have all your ingredients ready before you start cooking. This is a high heat, fast cooking method so you won't have time to stop and chop things up. 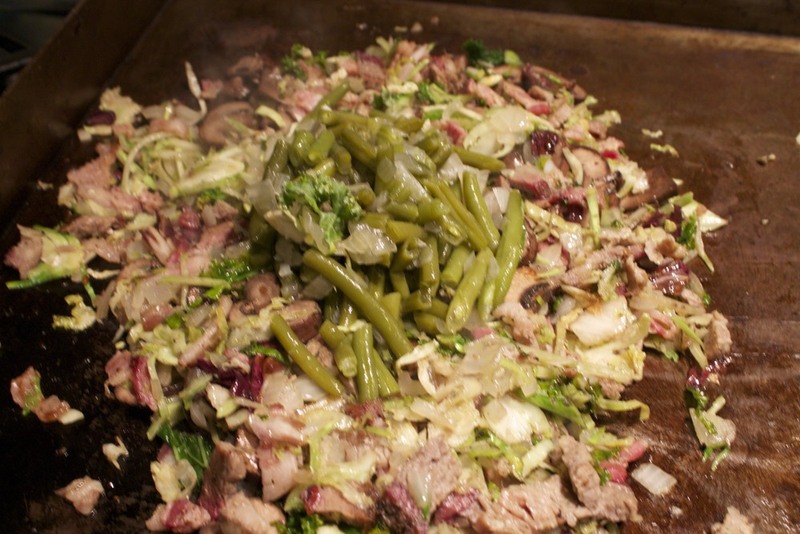 The last thing is to make sure your skillet, wok, or cook top is really hot before you start. You want to get an instant sear when you start to add the ingredients. Posted in In The Kitchen and tagged with fried rice, leftovers, veggies. September 2, 2013 by Lynn Adams.